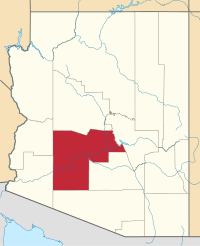 ^ Arizona Center of Population Ceremony, Arizona Geographic Information Council, 2005-06-15. Accessed 2007-12-17. ^ Woolsey, Matt. - "America's Fastest-Growing Suburbs". - Forbes. - July 16, 2007. ^ Indian Reservations in the Continental United States, Bureau of Indian Affairs on National Park Service website. Accessed 2009-01-18. ^ Gibson, Campbell. "Population of the 100 Largest Cities and Other Urban Places in the United States: 1790 to 1990." United States Census Bureau. June, 1998. Retrieved on October 7, 2006. ^ Joseph M. Arpaio Archived 2010年6月12日, at the Wayback Machine., Maricopa County Sheriff's Office, 2005. Accessed 2007-12-12. ^ Megan Cassidy, Maricopa County Sheriff-elect Paul Penzone names leadership team, Arizona Republic (December 20, 2016).